The Derwent Artists Pencil is the first coloured pencil developed by Derwent in the 1930s. This pencil has the instantly recognisable traditional round barrel and also features a wide colour core. This fat colour strip is ideal if you wish to create expressive, broad strokes in your drawings. There are currently 120 colours in the Artists range, and their slighly waxy texture makes them ideal for layering and blending. The ability to layer and blend with this pencil is ideal as you can create a whole spectrum of different colours to suit your work! Available in tins of 12, 24, 36 and 72, as well as wooden boxed sets of 48 and 120 pencils. 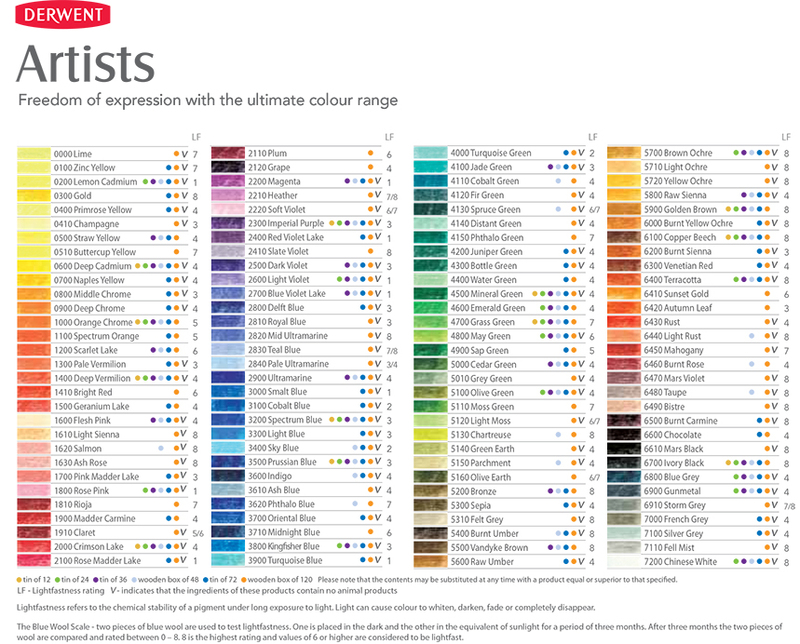 See below for a full colour chart. Make test charts of all the colours in your set. Keep them in a sketchbook for regular reference. Experiment with multiple layers of the same colour, layers of complimentary colours or modifying the basic ‘temperature’ of a colour by adding a light layer of blue, yellow or red. For subtle and evenly graduated areas of colour, work with a light, even pressure and create layers of light colour. Experiment with a range of marks; you can make large/small, random/regular, circular/directional etc. Invest in a good quality battery or electric sharpener for regular even points on your pencils. If using small hand sharpeners, replace them or change the blade regularly to avoid damage to the wood casing or breaking the coloured core. Keep a sandpaper block handy so that you can tidy up a dull point that isn’t ready for full sharpening. Marks or areas of tone made with pencils can be lightened and sometimes completely removed with a battery or kneadable eraser. Shape the tip of your eraser for removing precise areas. Keep an eraser pencil handy and use the brush end to remove eraser debris from your work. Establish the basic tonal range of your picture with an overall light under-drawing in a neutral colour (e.g. Burnt Umber and/or Ultramarine or Indigo) before worrying too early about colour accuracy. Use the side of the pencil to cover larger areas of work. Artists Pencils are not water-soluble. However, they can be softened or blended with a solvent or odourless thinners applied sparingly with a cotton bud. Use a Derwent blender and burnisher pencil for increasing the evenness and blending layered colour mixes. This video features a clip of professional artist Fiona Peart drawing ducks. During the clip Fiona shows various techniques including, how to use the side of the pencil to create marks, blending and creating a background. You can also download a project sheet where Fiona will guide you through the process of creating a lovely winter scene. Derwent Artists Black and White Pencils are a unique set of six warm and cool tones in Derwent's finest quality Artists pencils. Ideal for sketching, portraiture and more detailed illustrations. Encased in Cedar wood, they have a 4mm wide core and are highly lightfast (Blue Wool Scale 8). Available in a tin which contains a pencil sharpener and six Derwent Artists pencils: three cool tones (Arctic, Oyster and Pure) and three warm tones (Midnight, Forest and Raven). Designed for blending and creating complementary tones and highlights, these six colours are an additional colour selection to our existing range of Artists Pencils, available in 120 colours. Click here to download a project sheet where artist David Sandell provides step by step instructions to creating a stunning black and white portrait on cartridge paper, using these artists' pencils! The tin of 6 Black & White Artists Pencils is available here.